As with my previous experience with the slippery warp, this is another learning experience in the world of handling fiber. I knew it was going to be trouble looking at this very curly and sticky thread. But I thought that under tension it would straighten out which it did to some exent. 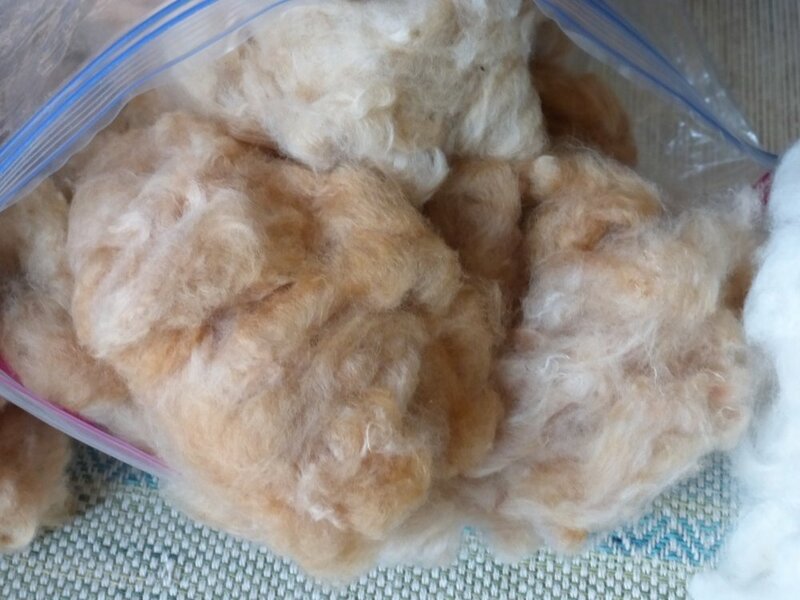 Recently my friend Angelita Abad, an Ecuadorean cotton spinner from Tumianuma about 30 minutes from here, brought me some of her home-grown, hand-spun cotton fiber to sell. It is so wonderful to work with real cotton thread straight from the plant so to speak. It is really beautiful thread with many natural tones intermixed. Sometimes I even find a few long black hairs in the thread but I leave them there which I guess serves as a kind of DNA signature for the future. The heads of cotton are so beautiful to look at. I can't resist buying all of it. But I'm learning how to evaluate the thread tension. When it is spun too tight, it folds back on itself and becomes a constant pain to manage. I didn't look closely at the most of the recent heads that i bought and later found out that there are very tightly spun. So I had to look up all the ways to relax overspun thread. It is very tedious. But one option is to ply it to make it more manageable. I don't own a spinning wheel (yet) but I realized that the Navajo Spindle (that I got from my friend Cynthia who is now traveling the world) could be used for plying. So I learned a few things about Navajo Spinning on YouTube and will leave the links to the most useful videos below. Here is the Navajo Spindle surrounded by cotton heads, cotton cakes and sample scarves. You can't really see its height but it is 32" (81cm) tall. I"m happy to report that I was able to get the rhythm of rolling the shaft down the side of my thigh to make it spin. My first plyed thread is irregular in tension but I get the gist and can get better at it considering that almost all of the thread from Angelita was overwound! Here is the result of the first batch. I don't know what I will make from this 2ply cotton thread but i like the texture. This is a closeup of the design on this beautiful Navajo Spindle. This is a good explanation of how it works and what it means 'to spin off the point'. This fellow does a good job of explaining the history and technique of the Navajo / Southwest Spindle. This is a pretty video to watch and it has some explanation. 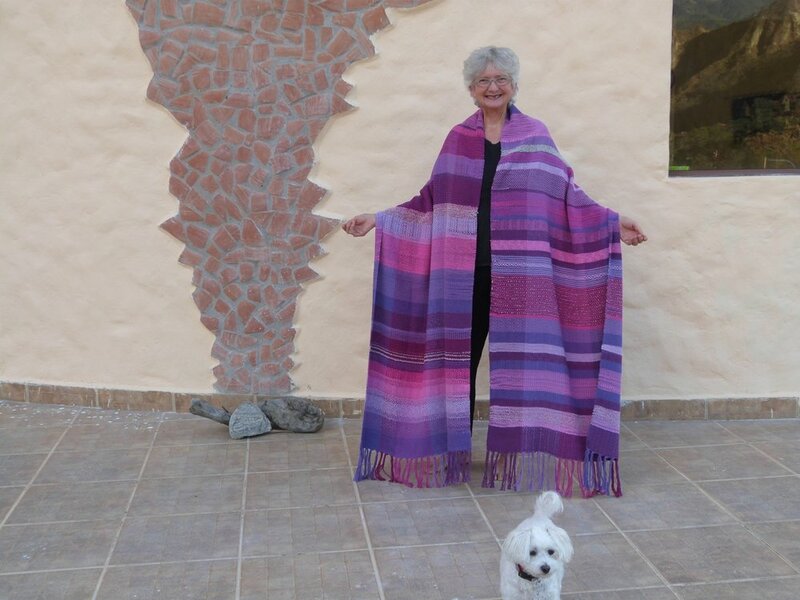 My most recent experience with fine thread turned out so nice (see previous post) that I felt confident buying other fine threads. But I learned that there is a lot of difference between un-mercerized threads, that I am used to using, and mercerized threads which are shiny and more slippery. So after finding that the warp was slippery, I changed gears, chose a heavier cotton and wool for the wefts and came up with 3 different samples on the same 5ft. warp. I also decided to incorporate a wonderful linen woven ribbon that was gifted to me. This is the fanciest and most beautiful thread I have ever used - Kestral from Quince and Company, made in Italy. As you can see, just a little bit of a specialty thread can make a project pop. This gift of specialty thread turned up just as I was preparing this fine thread warp and I was excited about how well they went together. This shows the problem of the slippery warp. The fabric looked solid but as soon as you put pressure on the cloth, the threads slid around and created holes. For the first sample I used a combination of fine and thick cotton threads and beat it as hard as I could to make the threads mesh together. Close up of some of the patterns. The fabric has a nice drape and some shine from the mercerized weft threads. In the second sample I used just two colors of the thicker cotton thread alternating with the linen ribbon. The heavier cotton thread made a thicker, less drapey cloth. For the third sample I used the thicker black cotton and a gray wool thread. I did a clasped-weft technique which uses double threads. It is an interesting balance between the black and gray threads. 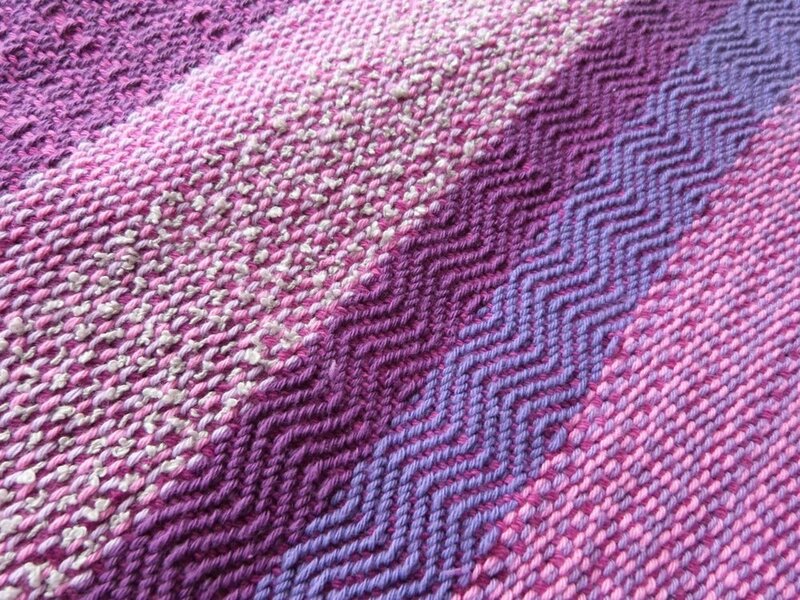 I like how the colorful warp shows through both the black cotton and the gray wool. I decided for my 100th weaving project that I would use the smallest thread I have ever used and I would use all 720 heddles on my 36 inch Leclerc loom for the first time. For the warp I used undyed 8/2 cotton which is typically used for dish towels. For the weft I dyed several shades of blue green that look like seaweed colors to me. The resulting Seaweed Shawl had double warp threads (720) which I found out muted the dyed weft threads. 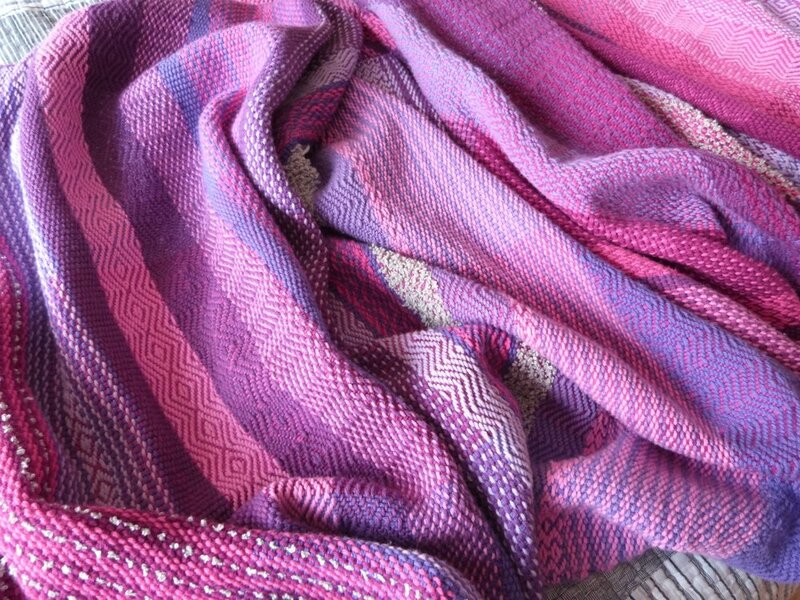 So for my next project with the dyed threads, I used only 360 warp threads which allowed the dyed weft threads to be more brilliant. This is my Leclerc loom dressed with 720 threads. I used to be afraid of working with so many threads but this project has given me more confidence. The Seaweed hand-dyed color palette. The cotton has been growing now since October 2016. The plants are much taller and fuller now and producing well but I have one mystery to solve. I got Virginia green cotton seeds from a friend but so far those plants only produce white cotton. I wonder where the green cotton is? Could it be a nutritional problem? Scroll through the pictures to see the lovely green covered seeds that produce white cotton. I would love to hear from anyone with insight into this situation. A row of cotton plants - some of them are taller than me now. A nice group of white cotton from Virginia seeds. This is the Ecuadorean white cotton. It hangs down in 3 long pendulums. They call it 'bulls balls' for obvious reasons. These pests use the soft cushy cotton balls to mate with their partners. Sometimes I find 5 or 6 couples in there! The Ecuadorean brown cotton plants have 4 parts and don't dangle like the white cotton. A picture perfect white cotton ball from Virginia seed. You can see from the back that this cotton came from the Virginia dark colored plants. A bag full of Ecuadorean brown cotton. It has a thick texture. This is the Virginia brown cotton. It has a silky texture and is more reddish/orange than the Ecuadorean cotton. I haven't seen much difference between the Ecuadorean and Virginian white cotton so this bag is a combination of the two kinds. An overview of the 5 kinds of cotton seeds I have planted. This is the mystery seed. A stunning green color...but it produces white cotton instead of green. The Virginia white and brown cotton seeds. The Ecuadorean white and brown cotton seeds. 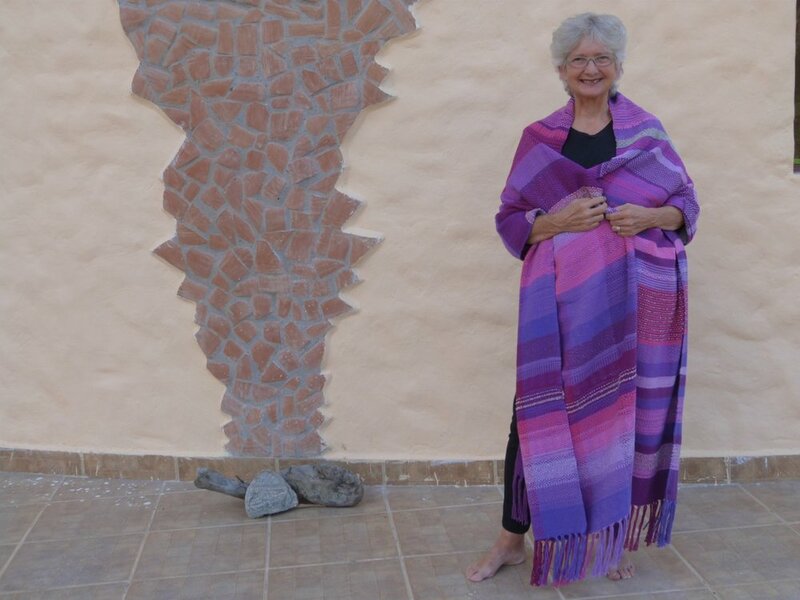 A friend in England asked for this super long shawl in her favorite colors of pink, purple and blue. I had fun playing with the different patterns that I can make on my 4 heddle loom. 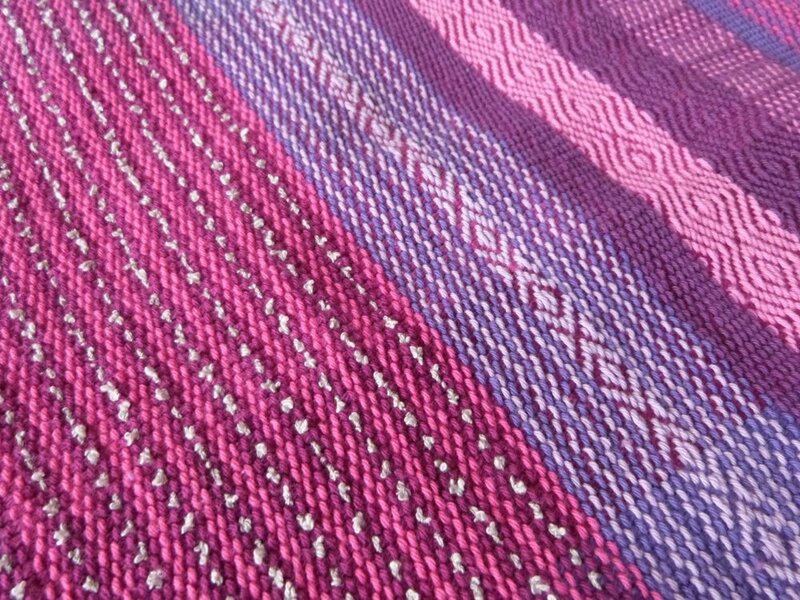 I'm still learning but I realize that learning never ends especially in the deep world of weaving.